This Website Is No Longer Active. : Former Welsh Inspector of Social Services David Johnston deliberately perverted the course of justice and falsified evidence." The Welsh Office and The Welsh Assembly are corrupt.The South Wales Evening Post is hiding the truth and is not fit for purpose. Former Welsh Inspector of Social Services David Johnston deliberately perverted the course of justice and falsified evidence." The Welsh Office and The Welsh Assembly are corrupt.The South Wales Evening Post is hiding the truth and is not fit for purpose. It is for you to read in full but I take out the following statements. COUNCIL chiefs are staying tight- lipped over shocking allegations into the way a child custody case was handled. One of the authority's own councillors has also voiced concern about the case and said it was now up to the council to "rubbish" the claims. Coedffranc North councillor Keith Davies said: "I am not happy with the way the case has been handled. "There is a lot of truth and substance to some of the allegations that have circulated. "It is now for the council to address those allegations and rubbish them." Once again read the article for yourselves.I have taken out some more valid statements. PRESSURE is mounting on council bosses to come clean over shocking allegations into the way a child custody case was handled. Opposition leaders in Neath Port Talbot say councillors have been kept in the dark over the matter and have made a united call for the truth to come out. One of them, Independent party leader Andrew Tutton, said: "Councillors should be informed as to what is going on. "These are serious allegations and, for clarity and people's peace of mind, members of the public are entitled to answers." Lib Dem Coedffranc North councillor Keith Davies said it was up to the authority to rubbish the claims. "Before the council went to court, only one elected member had any knowledge of this injunction," said Mr Davies. "We would wish to make it clear that no councillor nor any committee of council has discussed or passed a resolution in connection with these matters. "As elected members, we do not wish to be associated with the injunction. "They were not done in our name. We do not wish to be associated with this injunction. This forced Colin Preece to make the following statement from the same article. Council social services boss Colin Preece pointed out the issues were historical and referred to a case 'fully scrutinised by the High Court' more than 10 years ago. "The High Court continues to consider that identities should be protected," he said. "By reason of the terms of the injunction, local authority officers are unable to disclose further details in this matter. "Senior local authority officers are satisfied that the matter has been properly considered and decided by the High Court both historically and at the present time." It is almost three years since this article was published Neath Port Talbot Council, The Welsh Office and The Welsh Assembly Government still refuse to acknowledge their part in covering up for this absolutely disgusting abuse of power. The injunction that they like to hide behind is illegal. No injunction can be taken out to cover up for criminal acts and there is no time scale for prosecution as far as fraud, perjury and kidnapping is concerned. In fact I have broken this Injunction " under " Public Interest Law " and have proven that it was fraudulently obtained. False,fraudulent and fabricated evidence was submitted into a family court by the then Welsh Inspector of Social Services Mr David Johnston. David Johnston fraudulently claimed that " suicide note " was found by a Miss Penny Mellor when visiting Linda's home. An accusation strenuously denied by Penny Mellor on two occasions. What was also illegal about this court case was that Linda Lewis was unaware of it taking place. It was done covertly with the simple aim of entering false and damning evidence as a means of covering up for the medical negligence that Linda's daughter had suffered at the hands of the medical establishment. If Linda or Penny Mellor had been there they would obviously have refuted David Johnston's "suicide note" claim and would have demanded to see the non existant evidence. As far as David Johnston was concerned this could not be allowed to happen. The truth of his deceit had to be concealed. What sort of man is David Johnston ? Still Welsh Assembly Members, Neath Port Talbot Social Services, Hywel Francis MP and the Editor of The South Wales Evening Post Spencer Feeney still refuse to act and allow this deceit and illegality to continue to protect their own worthless and useless positions and careers. As long as such individuals are allowed to act without impunity and outside the laws of the land then " No Child " can ever be considered safe in our country. David Johnston formerly the Social Services Inspector for the Welsh Office commits perjury by submitting false and fraudulent evidence into an unlawful court. It is a sad state of affairs that until recently David Johnston was a Director of Skylakes Social Work based in Ipswich. Skylakes motto is " Skylakes is a Social Work business that’s paid for results." Further proof that children are not looked on as individuals but as a trade-able commodity. He has since moved on to another position of Seniority that involves dealing with vulnerable children.This man should be in jail. Over 6000 Sovereignty Magazines sent out to supporters and members. Dr Dewi Evans exposed as liar, perjurer,falsifier of evidence and instigator in the kidnapping of an innocent child. The South Wales Evening Post helps keeps the cover up alive. Welsh Assembly Government. Guilt admitted by the silence of First Minister Carwyn Jones. As a result of "false and fraudulent" evidence being sent by Neath Port Talbot Council Social Services 28 Laws were broken in America. Tearful pleas from a distraught and ill 12 year old girl to come home. This is an appalling abuse of power by the individuals involved and I hope that all of them are brought to Justice and punished for their crimes. My heart goes out to Linda and her Family for what they have been put through and as this case shows, the establishment are rotten to the core. I think there are a lot of worried people out there now as the evidence on them is damming. You have done a sterling job in exposing these vermin so lets hope that Linda gets the Justice she so rightly deserves. As someone in possession of the evidence disc I won't let you or Linda down. What has been done here is a national disgrace. Let's now see what our politicians are made of. I am amazed how these people sleep at night.Mr Johnson has abused his power and should be made accountable. 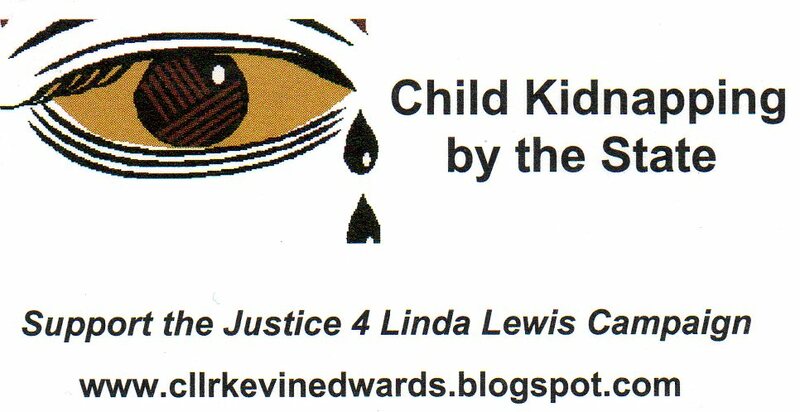 I have read all articles regarding Justice for Linda Lewis. I have noticed that the Welsh Assembly remain silent. 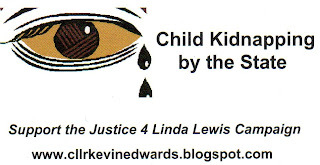 Lindas daughter has be held as a medical hostage for years the whole case is bloody evil. A big thanks to everyone who is helping Linda to expose her case. The stench that emanates from the Welsh Assembly Government, Neath Port Talbot Social Services and the South Wales Evening Post is rancid and needs to be cleaned up. defies belief, this is a crime against humanity. Well done Councillor Edwards for speaking out. Excellent work Kev let,s hope Linda will have Justice she deserves soon. Keep up the good work top man. People in authority think they are above the Law. Mr Johnson should be arrest. If we the ordinary people did this then we would be made accountable and so should he. it's a total abuse of powerby by the so called system. Are the government aware of this case, because David Cameron stated that the Government was taking crime serious. From what I have read Germany comes to mind.